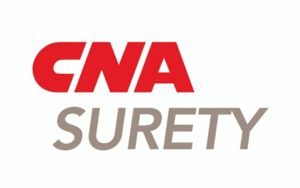 CNA Surety provides a full range of surety and fidelity bonds in all 50 states, Canada and Puerto Rico. The company has the capacity, experience and dedication to serve a full range of bonding needs, from the smallest commercial bonds to multi-million dollar contract bonds. The CNA Surety underwriting companies, Western Surety Company, Surety Bonding Company of America, and Universal Surety of America, are rated A by A.M. Best Company and A- by Standard & Poor’s.